Learning Chinese Grammar? Own It with These YouTube Videos! Navigating the seas of Chinese grammar isn’t easy. It’s enough to drive you to an existential crisis. Unfortunately, you can’t just ignore Mandarin grammar. Believe it or not, there’s a painless way to go about learning topics like these. And it doesn’t even require too much of your time all at once. YouTube is loaded with Chinese learning channels and tutorials that make it easy to handle Chinese grammar. But you don’t need to spend hours looking for the right ones. Below we’ve put together a simple guide to learning some sticky parts of Chinese grammar for you. Each section has under 30 minutes of videos. Here’s hoping they’ll help smooth out the seas for your Chinese! Before we get into the explanatory videos in this post, we should acknowledge that along with the basics of grammar, vocab in context is super important at any level. So to actually make use of the structures and patterns you learn in the videos below, you can check out FluentU for authentic vocab-and-grammar-rich material—like movie trailers, music videos, news and inspiring talks—that’s been specially selected from YouTube and dressed up with convenient features for you, the learner (much like the videos in this post). The biggest challenge for beginners (and self-taught Chinese students) is the basic sentence structure. Even some experienced Chinese students naturally fall back to the sentence structure they know best. The cure? Start with the video below. Luke Wang’s whiteboard animations walk you through the golden rule of Chinese grammar. They’ll help you to be able to visualize how to construct a sentence in Chinese, and that should help you avoid falling back into an English sentence structure when speaking Chinese. You’ll also learn to ask questions in this video. So here’s the golden rule of Chinese grammar: Subject, (Time, Place,) Verb, Object. Conversations usually involve questions at some point. If you don’t throw in a question particle or options for answering, it sounds like you’re making a statement. In this section we’ll look at two types of questions: yes-or-no and content questions. Let’s start with the video below. Spoiler alert: there is no word for “yes” or “no” in Chinese. So what do you do? This video, hosted by the fabulous Cheng YangYang from Yoyo Chinese, goes through a more focused explanation. Chinese structure in English: “You want” plus verbal question mark. The Chinese structure for content questions is really easy, but because it’s so different from English, it can be hard to remember when you speak Chinese. Luke Wang’s whiteboard animation above explained how content questions and answers work. This second one from YangYang reinforces the point. Ready for a review of what you’ve already learned? The talented Ben Hedges of Learn Chinese Now hosts his Grammar Guide video series to walk you through some hard-to-handle parts of Chinese grammar. In this video, he visits the golden rule of Chinese grammar as well as asking and answering questions in Chinese. See how well you can follow along with what he’s teaching. When you ask a Chinese teacher about tenses, some of them will immediately say “Chinese doesn’t have tenses.” If you’re thinking “that makes no logical sense,” you’re right, it doesn’t. Although verbs don’t get conjugated, the concept of tenses is still expressed. Below are some videos to help you handle tenses in Chinese. Here’s another whiteboard short from Luke Wang that breaks down a very simplified version of tenses in Chinese. In the video, he admits that the explanation is oversimplified, but it’s the perfect springboard for understanding how to think (and therefore communicate) in Chinese. But what if you’re on the phone explaining what you’re doing right now? Mary Chen offers one minute Chinese grammar video tutorials, including this one to explain how to use the word 在 (zài) to express what you’re doing right now. To talk about what you’re doing now, add 在 (the equivalent of “am/are/is” and “-ing” after the verb) after the subject. Note that “time” is not included in this sentence structure because the tense implies that the verb is happening right now: Subject, 在, (Place), Verb, Object. Now, we’ll build into the future. ChineseClass101 brings you a teacher’s answer to the question, “Does Chinese have a future tense?” If you enjoy this video you can get lots more on different grammar, vocab and cultural topics by subscribing on their website, along with other goodies like PDF lesson notes and access to a learner community. When talking about a future time, add 会 (huì – will) before the verb (although 要 — yào is also used a lot, 会 seems to be more common). Now for past tense (deep breath). Many people are befuddled by 了 (le — …just watch the video below for a definition). What do you have to do to understand how to use 了? Thank Ben Hedges for working up this video. People have actually written doctorate papers on how to use this character. Some Chinese teachers intensely deny that it equals past tense, even though it’s constantly used for situations that at least involve the past. In this video, Ben goes a step further, showing you how 过 (guò) and 了 can actually work together to create a commonly used time concept. If you want to talk about something that already happened, put 了 after the verb. To talk about an action being completed, put 过 (referring to something that has been done) after the verb. Note: 过了 does not literally mean “already.” They are a combination of grammar particles that imply the word “already.” The actual word meaning “already” is 已经 (yǐ jīng). I once had a Chinese teacher try to explain this in class on the spot with no advance preparation. It didn’t go well. We actually pointed out some of her mistakes. If you get stuck on these, don’t feel bad. The natives do also. In this video, Luke Wang brings another whiteboard animation to the table to help sort out how these three characters are used. The three des. Here we go. Let’s see some ways they can be used. Have a look at the video below to review. Ben Hedges talks you through this tricky grammar function, explaining how the three-character-one-sound trio works with verbs, adjectives and adverbs. Sentences with 把 (bǎ) and 被 (bèi) are the Chinese student’s intermediate-life crisis. Everything seemed conquerable until now. Luckily, it still is! Check out the video below. 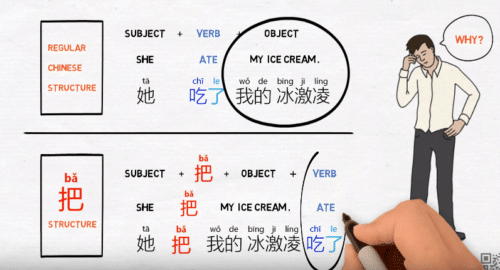 One more whiteboard animation from Luke Wang explains how the 把 particle rearranges the sentence so that the verb is emphasized. The video provides a little bit of insight into the subtleties of Chinese communication—what you say last is most important. So, 把 moves the verb to the end of the sentence to emphasize it. Saying 把 makes the listener wait for the verb because it’s what matters most. The 被 structure introduces the passive voice, which by definition is in the past. Ben Hedges sits down to explain how 被 introduces the passive voice and gives a little bit of advice for when to use this word. The 被 structure emphasizes the subject of the sentence. If there is no subject, it emphasizes the verb. These sentences usually finish with 了.
Here’s the structure with a subject: Object, (Time, Place,) 被, Subject, Verb, 了, (other objects). Chinese grammar shows a different thinking pattern from English, so don’t feel bad if these or other grammar structures aren’t so easy to understand right away. The important thing is to keep practicing in ways that are engaging and entertaining for you. Happy sailing on the seas of Chinese grammar! Lovers, Pals, Strangers… Chinese Terms of Endearment for All!